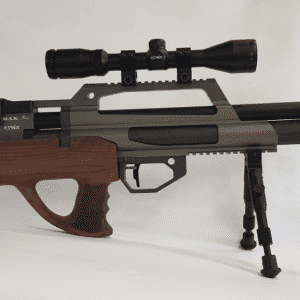 The all new air actuated Evanix Air Speed, in .22 (5.5mm), a fully air actuated semi-automatic air rifle. 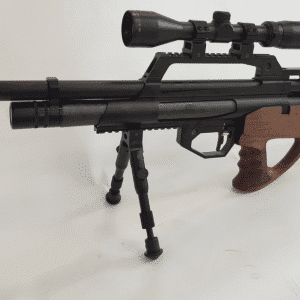 These guns have a fill pressure of 250 Bar, they have a shrouded barrel, 280cc air reservoir, an overall length of 43.3″, and weigh in at 6.6lb, and come with a Synthetic thumb hole stock, and are capable of up to 35fpe out of the box. The new and innovate action does not require batteries or any external input for the semi automatic action. This is fully air actuated, and still retains an impressive shot count. Check out the video section of the site for independent video reviews of the gun in action. If you purchase you will need to purchase our Fill probe adapter. Evanix air guns use a fill probe to fill the air gun. Most guns use a standard male foster fill fitting. You will need the adapter on the left to adapt the male BSSP thread to a male foster fitting.